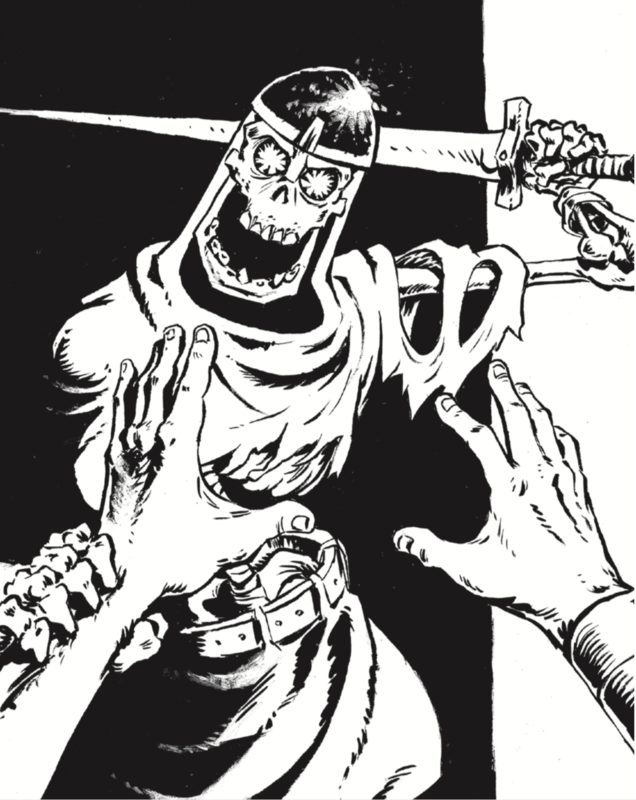 I had heard of the Black Hack in various Old School Renaissance (OSR) communities on the now doomed G+ RPG communities, but hadn’t looked in to it until recently. The publisher had a kickstarter over the summer that flew completely under my radar, but since the 126-page second edition PDF was only $6, I decided to take a gamble. I am so pleased that I did. 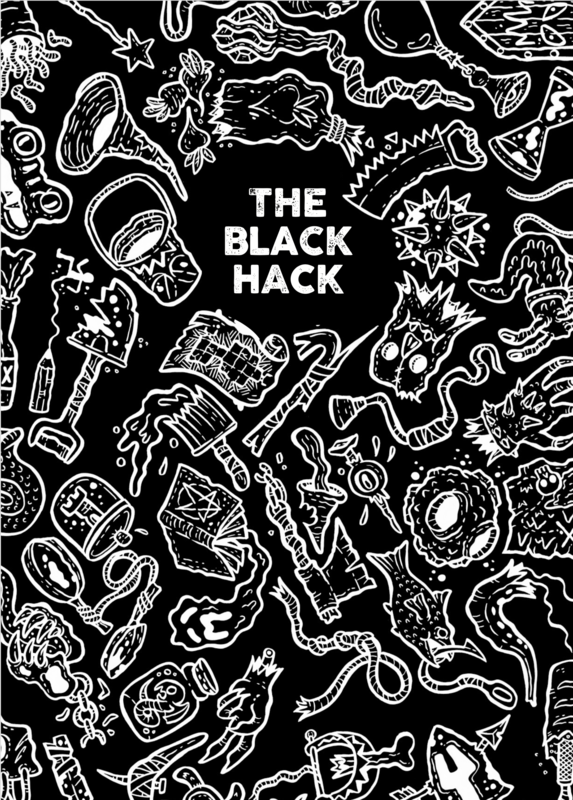 I have no experience with the first edition of the Black Hack, but the amazing resources in the second edition provide an easy to learn system for players, and a wealth of creative tools for GMs. This is one of the few systems that I would *not* bring pre-gens for in a convention setting. The entire player section of the game is a scant 30 pages, and character generation is TWO. 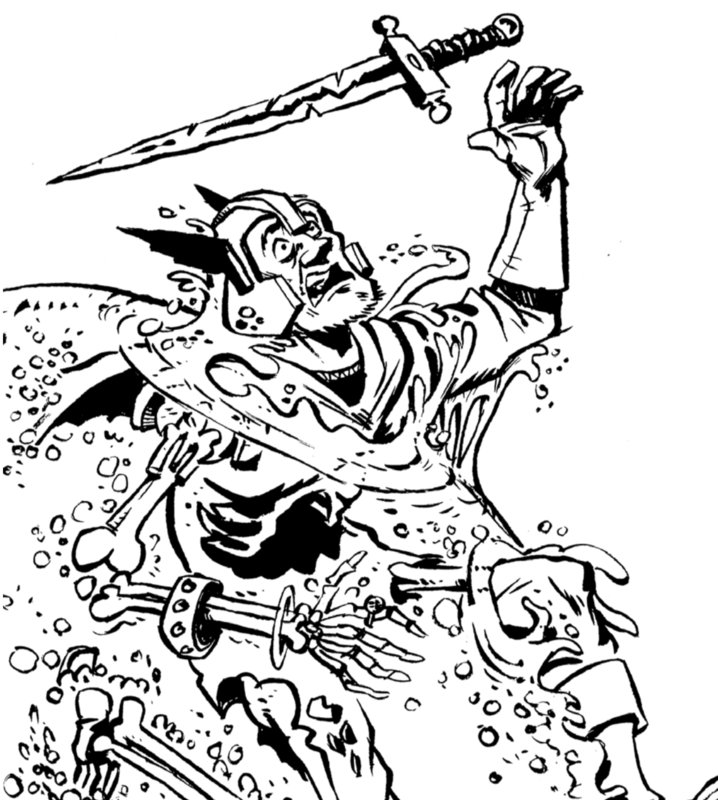 Each of the included classes (the classics: Warrior, Thief, Cleric, Wizard) has a simple character sheet and just enough options to give your character a few interesting bits of equipment and mechanics. Each of the four classes can be printed on a single sheet, front and back, and the player will have just about everything they need. This system is a great example of the mechanics aiding creativity and story-telling, and not getting in the way with endless fiddly bits. For example: one of the core mechanics is the attribute test. Your attributes are generated via the classic 3d6 method. Roll under the attribute called for in the test, you pass. Roll over, you fail. Initiative is a great example of this: roll under your Dexterity. Pass? Go before the baddies. Fail? Go after the baddies. Quick. Easy to remember. Fun! It also makes use of the popular advantage/disadvantage mechanic used in D&D 5e. Since you want to roll under your attribute, you would take the lower result for advantage, and the higher result for disadvantage. Another nice mechanic it uses for item tracking is the usage die chain. This is used to track anything that has a number of uses like arrows, holy water, oil etc. When you use the thing, roll the associated usage die. If you roll a 1 or a 2 it goes down one step in the chain: D20 > D12 > D10 > D8 > D6 > D4 > expended. For ammo it is only rolled at the end of the encounter. This is a nice way to reflect a limited resource without the dreaded Dungeons & Accounting that can take up so much time or is completely ignored by players and GMs in other systems. The art is very cool black and white pieces from Karl Stjernberg, David Black, Sean Poppe, and Jeff Call. A lot of the best work is reserved for the monster and opponents section. But the best part is reserved for the GM. This system has incredible resources to generate just about anything you could need for a game session: NPCs, hex maps, wilderness, dungeons, settlements, taverns, quest hooks, whats on the body etc. Some are straight rolls of a d12 or d8, others use 2d6 on a matrix, others are drop tables that have different results based on where the die lands on the page. This is the most succinct, concentrated creativity toolkit I’ve seen in any system. Even the monsters and opponents section includes tables to make every encounter unique. If you’re in a creative rut, this is about the best $6 you can spend. If you’d like to pre-order the printed version and missed out on the kickstarter (like I did), check out the pre-order page. See you around the table! I’ve got some adventures to generate! DCC 97 has been out since June, but somehow I missed it when it came out during Free RPG Day and just picked it up today. This is the first release to offer the awesome PDF code for RPGNOW in the front cover as announced at GEN CON. 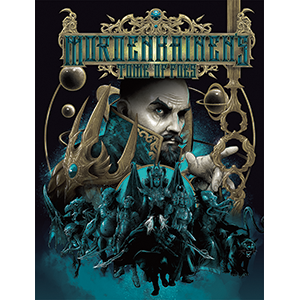 Any new DCC adventure from 97 on will include a code to redeem on RPGNOW for the PDF version. This is the best physical/digital offer I’ve ever seen since you can support your FLGS, and get a handy digital version for printing out handouts or maps. 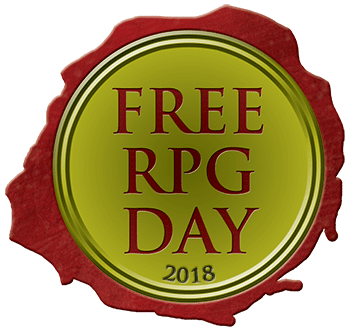 Kudos to Goodman Games and RPGNOW for putting together this deal. Once again, they are about a decade ahead of Paizo and WotC when it comes to innovation and rewarding their judges/GMs. This release also features a very cool, very pulpy cover from the artist Sanjulian. I don’t know if it was commissioned for this adventure or was recycled from another work. It is pretty cool looking, but doesn’t make a lot of sense for this particular adventure, unlike the custom Kovacs covers that usually show something from the module like an encounter or iconic creature. The interior contributions from the usual suspects like Kovacs, Poag, and Cliff Kurowski are excellent as always. The cartography for this one is by Poag and is a nice blend of the heavily-illuminated style of Kovacs and digital clarity of maps from DCC adventures in the D&D 3.5 days. 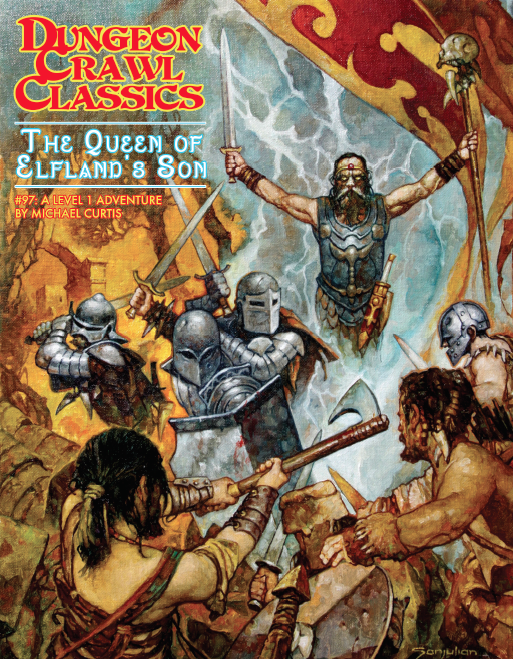 The adventure itself is inspired by the Appendix N entry The King of Elfland’s Daughter by Lord Dunsany. This marks the first DCC adventure in which I have read the inspirational material before the release of the adventure. If you haven’t read it, I highly recommend it! It is by no means required to enjoy this adventure, but there are a few nods to the source material and it is fun to see how Michael Curtis has incorporated some elements from the book in to the adventure. This is a first level adventure that would work very well as a first foray after a funnel. The village of Eng isn’t really the focus of the adventure, and could either be substituted out for a different starting hamlet or fleshed out to provide a starting base of operations for adventurers. This adventure weighs in at 20 pages, including maps, and would likely work for a typical 4-5 hour convention slot. It has a short introduction, and two main parts. Without getting in to spoiler territory for potential players, there is a nice mix of investigation, combat and social encounters to allow every role a chance to shine. A sequel to this adventure is alluded to a few times in the text, so it looks like this will at least be a two-part story, but this one stands on it’s own just fine. This would be a great adventure for those new to the DCC system as the adversaries are fairly straight forward, while still providing a few surprises for experienced delvers. Ask your FLGS to order this one, and cash in that PDF code! See you in Elfland! 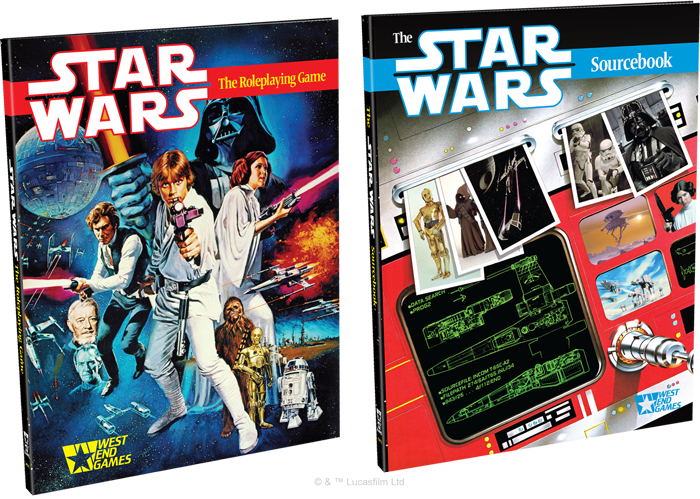 The most recent sourcebook for Fantasy Flight Games Star Wars RPG is an Age of Rebellion sourcebook expanding on the Spy career. I’ve been looking forward to this book almost as much as the bounty hunter book for Edge of the Empire, and it does not disappoint. 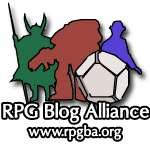 It follows the familiar format of other career source books: three sections, the first with new species and specializations, the second with new gear/vehicles/weapons and the third focusing on the GM and integrating spy characters into larger campaigns. If you are more selective about your sourcebook purchases, I would still suggest giving this one a look. It includes some interesting new species such as the nearly synonymous-with-spy Kubaz, the insect-like Melitto, and mantis-antennae-having near-human Balosars. Those “antennapalps” provide two advantage on vigilance checks, which may prove handy since willpower is not generally a strong stat for spies. Kubaz have enhanced vision which can cancel out two setback dice from perception checks due to environmental factors. The Melitto have sightless vision and never need light. Seeing as it looks like they lack a mouth, Melittos could make cool silent snake-eyes type spies. The three new specializations are courier, interrogator and sleeper agent. Thanks to some generous 5 XP skills, courier is a more compelling choice than you might think at first blush. To the base spy skills of Computers, Cool, Coordination, Deception, Knowledge (Warfare), Perception, Skullduggery and Stealth, Courier adds Athletics, another Deception, Streetwise and Vigilance. With 5XP talents Well-Travelled and Pilot Training, this quickly becomes a very well-rounded tree mostly focusing on agility and intellect. Well-traveled makes Knowledge Core Worlds and Outer Rim career skills. Pilot training does the same for Piloting Space and Planetary. There are some parkour talents like Freerunning and Swift for personal movement, as well as some that apply to either personal or vehicles like Shortcut and Lose Them. This makes courier a solid choice for a pilot/analyst in your rebel spy cell. The only glaring omission is any kind of weapons skill, but that can be addressed with a dip into the universal recruit tree from the Age core book. Interrogator is a surprising choice for a PC specialization, but could be an exciting one the way they have it written here. To the base spy skills add Charm, Coercion, Medicine, and another Perception. This makes the interrogator the de facto “face” spy, relying more on social skills rather than subterfuge. The talent tree has a good cop side and a bad cop side, as well as talents about called Resist Questioning and Made You Talk. One of the most interesting is a 25XP skill called Pressure Point that allows the PC to make a brawl check that does stun damage equal to ranks in medicine ignoring soak. This could be used to judo-chop some minions or knock out a weakened rival or nemesis for questioning. Other than the scout, this is the only other Spy spec with access to medicine, and with access to two ranks in Surgeon may be the best healer of the bunch. Every rebel spy cell could use a doctor/face. Sleeper Agent has some very cool benefits. To the base skills add Charm, another Cool, Discipline, and Knowledge (Education). The tree has some slicer talents like Codebreaker and Bypass Security. For 5XP you can pick up Well Rounded to pick up any two skills and make them career skills. This is a cheap way to pick up some weapon or piloting skills. Ideally these would match what your roll is in the Empire: Pilot, Soldier, Mechanic etc. The 25XP talents are especially cool: Inside Person and Inside Knowledge provide advantages to checks associated with a certain installation or large ship. You can also use it to find an item previously stashed in a location, which has cool story possibilities. Just as one would expect from any classic spy movie, the gear and gadget section does not disappoint. Weapons that fire invisible blaster bolts, wrist mounted razor launchers, hidden garrotes, and convertible pistols that can be switched to a sniper rifle with two maneuvers (thanks Cassian!) and some stealthy armor. Gear and tools include a fake tooth with a poison crystal inside, cybernetic implants of tools and lock picks (go-go gadget hydrospanner! ), disguises both holographic and implanted, concealed escape kits in the heel of a boot, explosive belts etc. Its just like walking into the lab of a Bond movie, as it should be. There are several droids detailed here, from interrogation, slicers, incredibly strong assault droids, and armored messenger droids. RA-7 stats are included as well. This was the inventory droid from Star Wars Rebels. A fair amount of space is dedicated to weapon attachments and enhancements to help conceal or break down weapons so they can be smuggled in to places they shouldn’t be. The vehicle and ship section just has one speeder and one star fighter with a lot of hard points to be used in customization. The vehicle attachments include lots of interesting options for cloaking, retractable weapons, and espionage electronics. You could certainly create something reminiscent of classic Bond cars filled with gadgets. The third section details campaign ideas and potential rewards for spies. It outlines potential pitfalls GMs could run into with groups that have a lot of direct-action PCs and one Spy that relies on stealth. Given the variety of skills in this career I think you could run a really fun rebel spy cell with PCs made exclusively from spies. This section also provides some really helpful suggestions for spending dice results for computers, deception, skullduggery and stealth checks. As expected, this was one sourcebook worth waiting for. The team at FFG is not running out of gas for this Star Wars line. I have yet to buy a book in this line that isn’t worth every penny. Even if you don’t collect them all, I highly recommend this one due to how well they stuck to the theme and the surprises along the way.